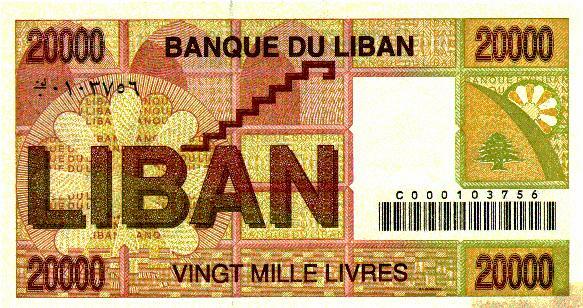 The 1975-91 civil war seriously damaged Lebanon's economic infrastructure, cut national output by half, and all but ended Lebanon's position as a Middle Eastern entrepot and banking hub. Following October 1990, however, a tentative peace has enabled the central government to begin restoring control in Beirut, collect taxes, and regain access to key port and government facilities. The battered economy has also been propped up by a financially sound banking system and resilient small- and medium-scale manufacturers. Family remittances, banking transactions, manufactured and farm exports, the narcotics trade, and international emergency aid are the main sources of foreign exchange. In the relatively settled year of 1991, industrial production, agricultural output, and exports showed substantial gains. The further rebuilding of the war-ravaged country was delayed in 1992 because of an upturn in political wrangling. In October 1992, Rafiq Al-Hariri was appointed Prime Minister. Al-Hariri, a wealthy entrepreneur, has announced ambitious plans for Lebanon's reconstruction which involve a substantial influx of foreign aid and investment. Progress on restoring basic services is limited. 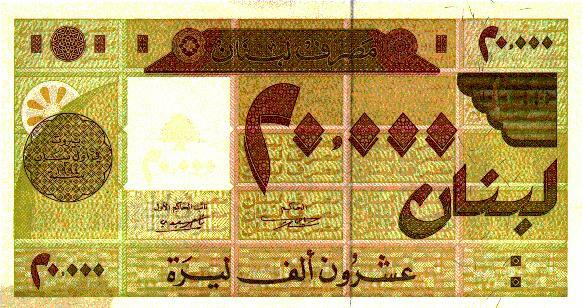 Since Prime Minister Al-Hariri's appointment, the most significant improvement lies in the stabilization of the Lebanese pound, which had gained over 30% in value by yearend 1993. The year 1993 was marked by efforts of the new administration to encourage domestic and foreign investment and to obtain additional international assistance. By occupation:services 60%, industry 28%, agriculture 12% (1990 est.). Accounts for about one-third of GDP; principal products - citrus fruits, vegetables, potatoes, olives, tobacco, hemp (hashish), sheep, goats. Aid for Lebanon's reconstruction programs currently totals $1.3 billion since October 1992, including a $175 million loan from the World Bank. Two standard-gauge lines from Syria: one down coast through Tripoli and Beirut to Az Zahrani; the other through Beqaa Valley to Riyaq. Narrow-gauge mountain line from Damascus to Beirut. In 1987 no trains operating on 407-kilometer system. System in disrepair, considered inoperable. Approximately 7,300 kilometers of roads in varying states of disrepair in 1987. Beirut hub of network extending north to Tripoli, south to Tyre, and east through mountains to Damascus. Roads also extending through Beqaa Valley and crossing Lebanon Mountains. Crude oil 72 km (none in operation): Trans-Arabia Pipeline (Tapline) from Saudi Arabia to Az Zahrani refinery but closed in mid-1980s. 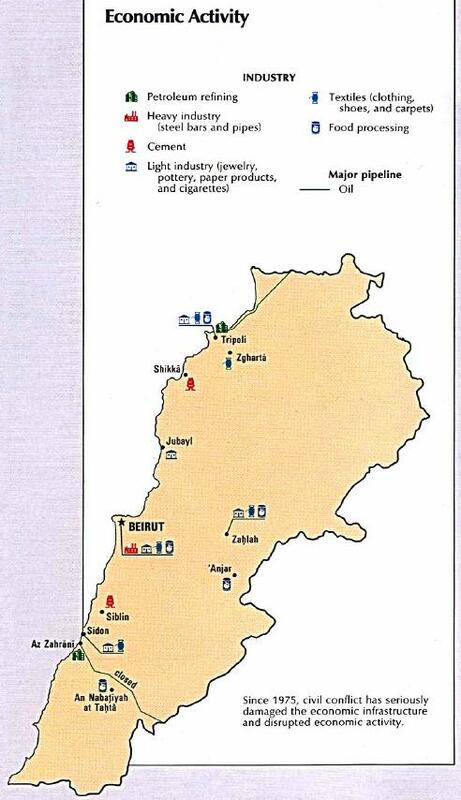 Iraq Petroleum Company pipeline through Syria to Tripoli refinery but closed in 1981. Telephone system: Telecommunications system severely damaged by civil war; rebuilding still underway. Note: More than 100 AM and FM stations are operated sporadically by various factions.